All Areas Demolition Excavation is a fully licensed demolition company which means no job you can throw at us will be too big or too small, and we love a challenge! 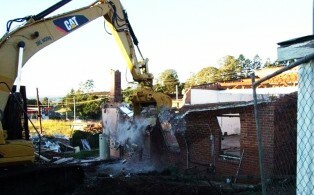 Finding a demolition contractor that can take care of the full service is essential. We hold an unrestricted demolition license and are also licensed to remove both bonded and friable asbestos. We can demolish any project, large or small; cut concrete, supply air monitoring services, propping and even steel fabrication or concrete remediation if required. Our skilled staff ensures all projects, no matter how big, are completed on time and safely, leaving a clean site for you to get the next stage of your project off to the best start.